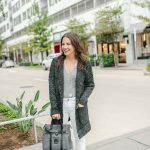 Striped Cardigan + BLACK FRIDAY Sales! Happy Black Friday!! 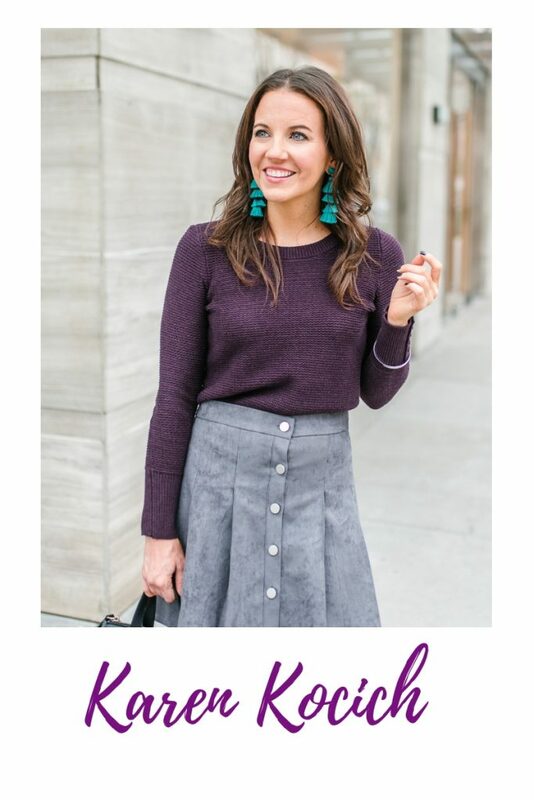 I have a little something for everyone in today’s post- a little cozy, comfy outfit inspiration and a good list of Black Friday Sales. Did everyone have a fun Thanksgiving?? I’m pretty sure I’m still in a food coma from all the yummy deliciousness I ate yesterday. I see a good run in my future today! Before we get to all the amazing Black Friday sales happening today, let’s talk about this cozy winter outfit. This striped cardigan is a little bit on the chunky knit side and perfect for cold days. I like it because I thought it would be perfect to toss over a simple work dress like the one featured earlier this week. 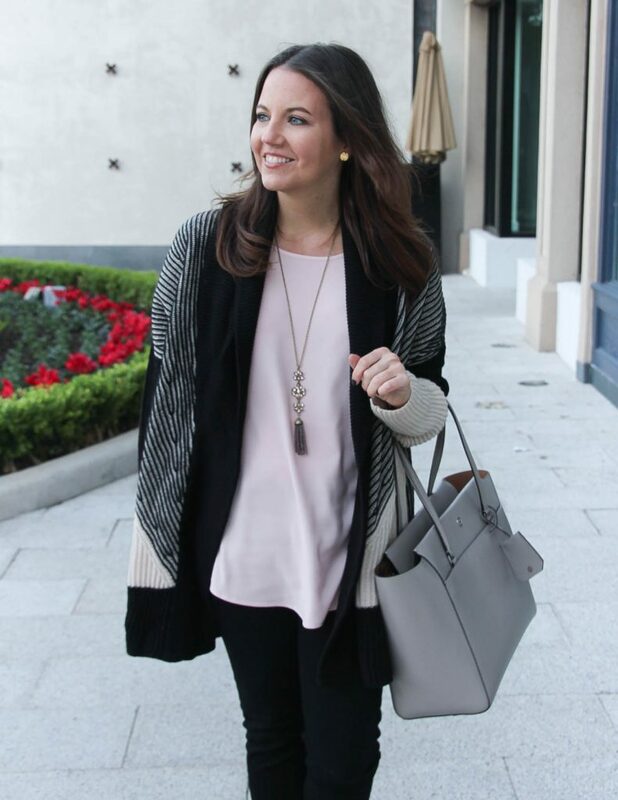 One color I immediately pictured with this cardigan was blush pink. I love the way the color blends with the beige colorblocking on the sleeves. Just enough to be different, but pale enough to blend. By the way this top is 50% off today and would also be cute tucked into a pencil skirt for work. Also since I raved about this bag in my last post, I have to let you know that it’s currently 30% off. You do have to spend $250 and the bag is currently only $209. You can always search the sale section to find something to get you to the $250. On the first day of the sale, I ordered these gorgeous and highly recommended for comfort gray flats and added this tank to meet the $250. After the discount was applied, my total was still less than the original price of the flats, and I can always use more workout tanks so it worked for me. Alright guys, now let’s talk Black Friday Sales – scroll on down for this year’s list! I have rounded up a pretty decent sized list of the best Black Friday Sales for fashion and beauty. 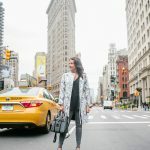 If you are shopping for yourself, I think this is such a great time to stock up on those high dollar designer pieces or just normally higher priced items. I just picked up this trench coat originally $349, now $149! My other big ticket purchase was a new camera for the blog. I wanted a smaller one and this one came highly recommended from my blogger pals. I found it $100 off Wednesday. That may have been a Wednesday only deal, but I’m still looking around in case I find it cheaper. I’ll let ya’ll know. I hope you all have fun shopping away today getting goodies for you and your family/friends too. Check back Monday because I plan to share a list of the must shop Cyber Monday Sales also. Happy Shopping Friday friends! BEST ITEMS OF BLACK FRIDAY! I’m sharing some of my favorite finds of the sales. Check back because this section will be updated throughout today and the weekend! Click any item to go directly to it! Also, don’t forget to enter the PROMO codes for the discount! 5 Responses to Striped Cardigan + BLACK FRIDAY Sales! That cardi is so cute! I love all the stripes going on here! Karen, I love that sweater!! The look is polished, but still comfortable- my favorite kind!!! Also, love seeing your picks! I love your outfit, Karen! Your cardigan looks so cozy!! Wow! So many great items to buy and covet my head is spinning! I have to stop looking at all these sales. LOL I love your chunky cardigan. I envision wearing it with a cute dress to keep nice and toasty during the cooler months. BTW, your handbag is gorgeous. I am drooling over that cooler. LOVE!